We talk a lot about keeping your employees happy, but how exactly do we do that? The short answer is in a variety of ways with one being the occasional company outing. Late last month we had the pleasure of visiting the Detroit Zoo to see the Polk Penguin Conservation Center, which opened last year. You can enjoy some of our candid shots in the slideshow below. More than 1,000 individuals – consultants, architects and tradesmen – worked on the project from start to finish. While digging on the construction site for the building and parking lot, ink tattoo bottles from the early 1920s were found intact 10 feet below the surface. The oak lumber used on the Endurance 4-D experience is reclaimed from buildings and barns in metro Detroit that were salvaged. The oak was originally milled in the late 1800s/early 1900s and would have been the exact type and age of lumber used to build the original Endurance ship which explored the Antarctic. Each element of rock work and ice work, both in the pool and out, was sculpted out of concrete completely by hand. The penguin habitat has the ability to produce more than a yard of snow and ice per day. The largest acrylic viewing window in the underwater gallery weighs 37,000 pounds. The heads-up display technology in the underwater gallery was developed in the automotive industry by Denso and is used in cars such as the new Corvette. The penguin center has near net-zero water goals through the recirculation and treatment of the habitat- and animal-management pools, wash-down systems and exterior fountain-skate area. A custom iridescent paint was developed for the metal panel system on the exterior, giving the building a different look depending on the time of day and angle of viewing. The paint is aptly named “Iceberg”. 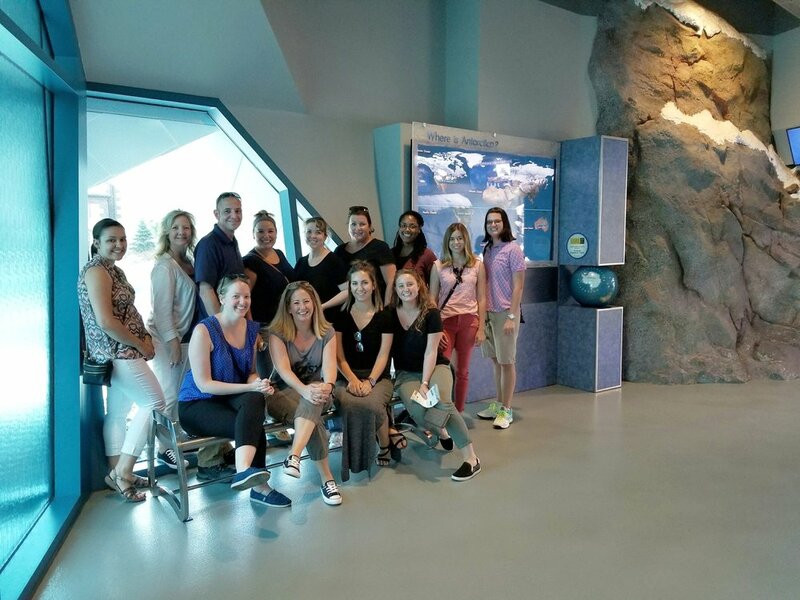 We had an absolutely fantastic time as a team experiencing the penguin exhibit as well as others like the Arctic Ring of Life and the new Edward Mardigian Sr. River Otter Habitat. Our outing made for an extra special Zoo excursion because the polar bears were exceptionally active. I’ve been there multiple times and have not witnessed them being this active before. The otter habitat was a great experience as well, as it was recently renovated and tripled in size. Get out of a creativity rut. Many of the members on our team are very creative in both their role at ISCG and at home. Being exposed to the natural environment and animals helps us reconnect with that creative side and helps generate new ideas. Team Bonding. Being together as a team and navigating the large area allowed us to work together in ways we are not used to. This helps us foster our relationships and helps us work better together. Happier Employees = More Profits! Companies with highly engaged and happy employees see an 18% increase in customer retention than those that don’t have engaged employees. “All work and no play…” The old sentiment is true for adults as much as children. Company excursions can help increase their productivity, reduce burnout and leave you with generally happier employees. We’ve told you time and time again that happy employees are going to give you the most bang for your buck, and give you less turnover. Especially in a time when ‘mental health’ is in the headlines, company outings are a great way to both give back to your employees and get the most out of them. The images on the screen is the same technology that is in the new Corvette. Project Manager Bill enjoying the Penguin exhibit. We can't go to the zoo and not try Dippin Dots! Workplace Consultants Nives and Mary Jo enjoying the zoo.